Lean design is all about achieving the most efficient, flexible spaces possible. At University of Michigan Health System, the seemingly lofty goal became reality thanks to an innovative detour from traditional design methods. 30 minutes of lean-driven spaghetti charting led to a 48% improvement in efficiency in an electron microscopy lab, reducing walking routes for critical process flow from 416 feet to 216 feet. The new-and-improved lab is just one example of the success of lean design at UMHS, the $3.4 billion academic medical center located in Ann Arbor. Bob Harris, Associate Hospital Director for Facilities Planning & Development, and Christine Baker, Project Manager, shared lessons learned from UMHS’ lean design journey at the Health Facilities Innovation Forum. 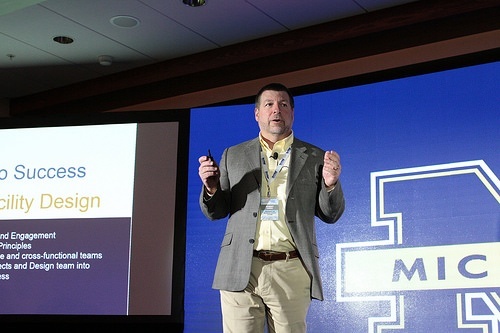 Although lean was operationally implemented at Michigan for many years, it wasn’t until 2012 that executive leadership requested lean principles to be applied to facility design. Right off the bat, Harris acknowledged there were initial challenges with accepting change on the team. Because traditional design doesn’t include user feedback about improving their process flow, it can leave users with a feeling of “that’s not what I wanted.” However, lean drives the design from process flow and builds positive trends related to growth, expenses, and opportunities for collaboration. In December 2012, the facilities team set off to Seattle to educate themselves further, visiting Virginia Mason Hospital and Bellevue Ambulatory Surgery Center. “They were doing a lot of things we weren’t, and what we learned was pretty mindblowing,” Harris said. -Lean is a mindset, not just a process. -Form follows function (now a motto within the team). -Improvements are measured in steps (literally). -Standardization is critical wherever possible. From applying these lessons to UMHS, construction change orders were significantly reduced, building sizes were reduced up to 20% from conception maintaining lean objectives, and business goals were exceeded. To be successful, however, it was crucial for four groups to understand the value and buy in: hospital leadership, hospital facilities, University of Michigan construction management, and customers. This required putting aside egos, suspending disbelief, and convincing customers that time invested would reap success. "If you think good design is expensive, you should look at the cost of bad design." UMHS started small with the journey, kicking off four key projects in 2013: the Child and Adolescent Psychiatry Hospital Relocation (CAPH), the UH Emergency Critical Care Center, UH OR Expansion, and Pathology Relocation and Renovation. The UH Emergency Critical Care Center now receives visitors from all over the country to see how the process flows, while two doctors from the unit also tour the US to speak on a clinical perspective on the advantages of making facilities more usable for customers. 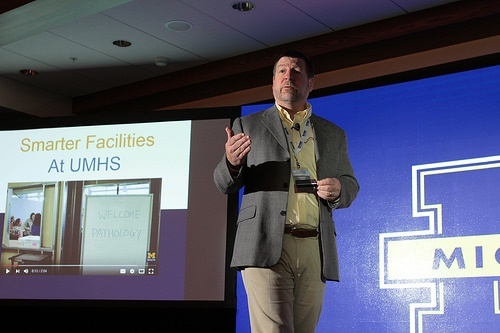 The first full-scale lean facility design effort at UMHS was the Pathology Relocation and Renovation. This was a project that was ready to go with a traditional design–the drawings were literally ready to go to bid. Yet Harris simply asked for forgiveness and permission in going with his gut feeling: to take a look at the facility and engage users for a week to do flows and spaghetti mockups. In just 1 week, the floor plan was revised so significantly in all measurable steps from a patient care perspective and was reduced by 33%. Baker, who oversaw the Pathology Relocation and Renovation, dove into additional detail. The 5-year, $160 million project affecting about 186,000 sq. ft. focused on moving a lot of non-stat functions off site about 3 miles away while renovating stat functions within the hospital. 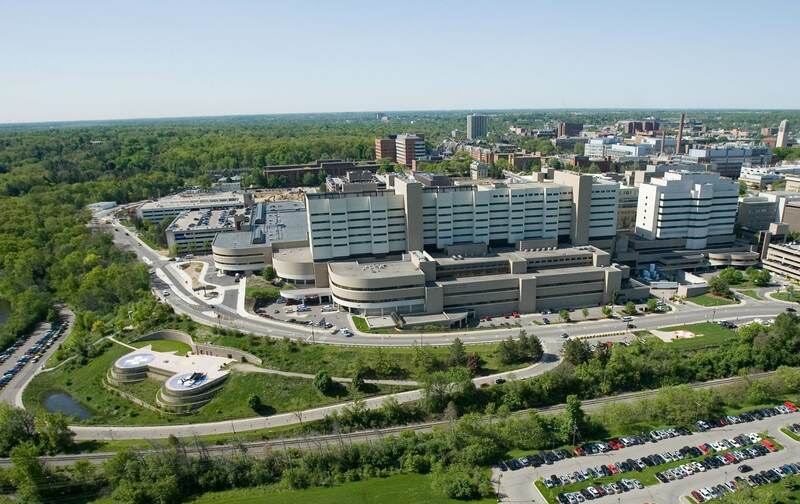 They split it into 2 phases: Phase 1 consisted of consolidating non-stat pathology functions into off-site facility, including administration, faculty, and labs, while Phase 2 is currently underway and involves renovating and expanding “stat” functions and labs at University Hospital. Baker provided step-by-step instruction on UMHS’ process. What is it? Developing high-level layouts. What is it? Laying out big process areas within departments. -Paper dolls, which are pieces of paper or cardboard representing key pieces of space and equipment. Baker reported that paper dolls were one of the least expensive but most valuable assets in the lean toolbox. -Spaghetti charting, which refers to actually drawing in the process flow, helping to establish more detail on how they will work together, identifying and reducing congestion, and analyzing areas not utilized. -Mock-ups. The opportunity to try multiple options creates an inexpensive and quick way to test out many ways to design a space. What is it? Very detailed layout of rooms and spaces. -Simulations, 3D tools, more detailed mockups, more spaghetti charting and paper dolls. -3D Cave/virtual reality “has been one of the most innovative tools”: allows users to see and interact with the space, creates opportunities to understand overall layout and adjacencies, and provides users with a “life sized” space to react to after multiple iterations of design with paper dolls and spaghetti charting (the engineering school allows them to use the 3D cave in a partnership with them). With multiple projects under their belt at UMHS, the team decided on four guiding principles based on their experience. “We spend a lot of time talking about process flow and the ideal process, and then building the facility around that process,” said Baker. Rule #1: Define the problem you wish to solve. Whether you’re looking to expand a facility or the opposite, the goal must be clearly outlined and returned to throughout the process. Rule #2: Engage the people who know the work the best. Traditionally, people go to managers or directors for design decisions–but the front lines of the staff often best understand the needs of the facility. At UMHS, they try to equalize people and build trust that people’s ideas aren’t just going to be overridden by a higher-up. Rule #3: Multiple iterations, trials and experiments. Especially important is making the design as visual as possible during mock-up sessions. Rule #4: Make it fun & engaging. “We believe it brings positive energy, creativity, and innovation. 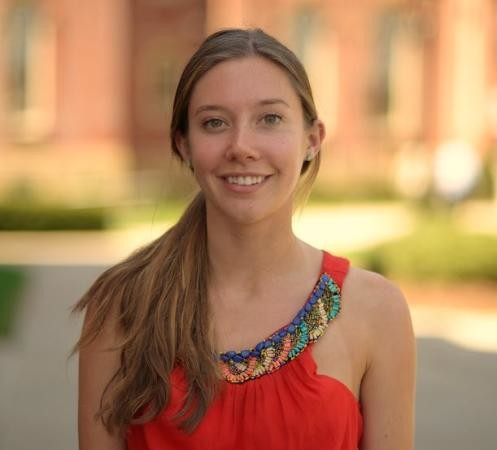 We do icebreakers and make sure the team is connected,” Baker said. 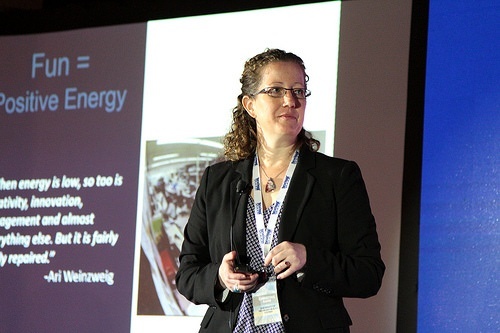 “What lean design ISN’T is facilities design without engaging that full spectrum of users and studying that optimal process flow,” said Baker. So what IS lean design? As Harris and Baker see it, it’s a comprehensive design system focused on optimized process and people flow based on guiding principles, a design team that includes many diverse voices, and frequent opportunities to “see” and interact with design. With leadership support, transparent guiding principles, participation by cross-functioning teams, and engagement of design team and architects into the process, lean design can lead to breakthrough improvements and prime optimization of workflows for health facilities.